When it comes to treating those annoying stretch marks you can often feel that no matter what you try, nothing seems to work. Stretch mark creams can be very costly and ineffective so what can you do to solve the problem? 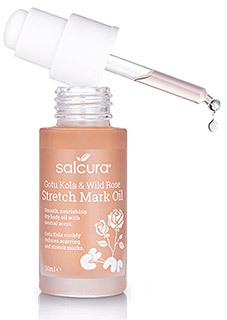 Invest in Salcura’s Gotu Kola & Wild Rose Stretch Mark Oil. Stretch marks can appear when you have a rapid weight loss or gain and can also occur due to normal growth and stretching of the skin. Salcura’s wonderful beauty elixir pampers and nourishes your skin while tackling your unsightly stretch marks. Gota Kola is one of the key ingredients in the oil, why? Because it contains an abundance of amino acids, beta carotene, fatty acids, and numerous potent phytochemicals. Goto Kola has been known to calm inflammation, help wound healing, stimulate new cell growth, build collagen, and improve circulation. Salcura’s stretch mark oil also contains Rosa Canina Seed Extract which is an extract of the seed of the wild rose, also known as rosa canina. Wild rose has anti-ageing properties, lightens pigmentation, rehydrates dry skin and can be a fantastic stretch mark treatment. Because stretch mark oil can be a little difficult to handle, Salcura have incorporated a click operated pipette which means nice and easy application with no mess or no spillage. Apply twice daily for 8 weeks, massaging well into clean, dry skin and then once daily thereafter. To obtain maximum results, use in conjunction with Rose Hip & Green Bean Stretch Mark Cream. Salcura’s Stretch Mark Therapy Range helps to reduce the visibility of stretch marks by up to 72% as well as leaving your skin nourished and firm so use as part of your everyday beauty regime and you won’t look back.